So I’m not sure if this is something that people will even be interested in but I got candles and I’m excited so you’re hearing about them. COOL. The first candle I picked up was this massive 3 wick Winter Berries candle. This one is the sweetest scent of all the candles I picked up, which is the scent I lean towards more. Since it was £2.99 I’m not expecting all of the wax to burn – I’ll probably get that big ring of wax round the outside whilst the wicks obviously burn down the rest. It’s a nice scent though, it’s not stupidly strong and I am actually burning it as I’m writing but I’m choked with the cold so I can’t actually tell you how it smells whilst burning. Love that. This scent is 100% my favourite of all of them. It just smells like Christmas. Which is probably different to a lot of people but my god this is so good. It doesn’t smell like apples at all so the name is a little weird. It’s not a sweet scent, but I’m not sure what the other ways of describing scents are. Musky? That makes it sound disgusting. It’s a really nice scent for the A/W period though, so I’ll probably burn this one last since it’s my favourite. If I ever burn it. I might just sit smelling it forever. This is quite a vanilla-y scent but not sickly sweet like most vanilla candles. It’s a non-sweet vanilla. Nailed it. This and Apple Orchard are definitely my favourites, they just smell so cosy. Is that even a thing? It is now. I actually don’t know what else to say about this, there’s only so much you can say about a candle. SMELLS GOOD. 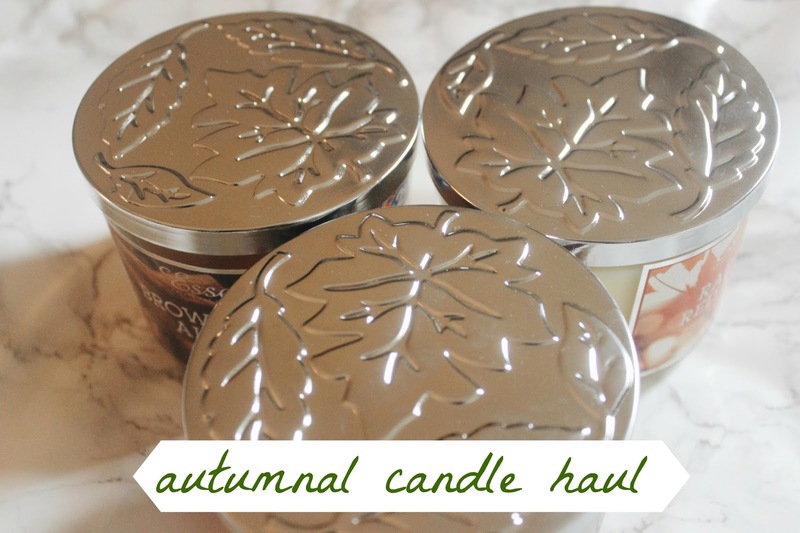 This one is your very standard strong spicy candle smell – which I’m not a huge fan of but the B&M tunnel vision got me and I just needed all the vaguely Autumnal smelling candles. I’m also burning this one right now but can’t smell anything, which is due to the phlegm not the candles. NICE. I’m not actually crazy about this scent which is why I’m burning it first – although the other two candles aren’t sweet-sweet scents, they’re sweeter than this one. This is as spicy as spicy scents come. Another thing I love about these is the lids. THEY HAVE LEAVES ON THEM! Ahh the Autumnalness. I just love it. This is definitely my favourite season. ALSO all of these candles were only £2.99. How good is that?! I have a feeling this is only the start of my Autumnal candle obsession. This one and the next one are late additions to this post, I bought them recently because I just can’t resist a massive candle. These are by Yankee Candle and you can find them in supermarkets – this one is Holiday Magic and oh god it just smells like all the best Christmas candles in one. I actually don’t even want to burn it because it smells too good. This was a birthday present from my parents – it’s not a particularly Autumnal scent but I still love it! It’s very sweet, which I don’t usually like, but for some reason I love this one. The cherry and the vanilla compliment each other well and it’s an all round very pleasant smell!